As per one of the latest research reports by Transparency Market Research (TMR), the vendor landscape in the global lidding films market is highly fragmented and competitive on account of presence of a large number of market players. The top ten companies are estimated to hold only 26.6% of market share in 2017. While players that operate globally clearly lead the market, they are wary about threats posed by local vendors. This is because small companies despite a small scale set up offer products at lower prices, which is giving competition to bigger players to establish themselves in regional markets. “In this scenario, the global players are focusing on core business plastic packaging and are discontinuing various non-core operations,” said a lead TMR analyst. For instance, in November 2014 Bemis Company Inc. discontinued its global Pressure Sensitive Materials Business. Also, leading players are striving to expand their market presence with innovation and inorganic growth to tap growth opportunities in regional markets. Some of the leading companies in the lidding films market are Bemis Company Inc., Constantia Flexibles Group GmbH, Uflex Ltd., Amocor Limited, Berry Global Group Inc., Winpak Ltd., LINPAC Packaging Limited, Schur Flexibles Holding GmbH, Plastopil Hazorea Company Ltd, Flair Flexible Packaging Corporation, Multi-Plastics Inc., Golden Eagle Extrusions Inc., FFP Packaging Solutions Ltd., Impak Films Pty Ltd., Flexopack SA, and TCL Packaging Ltd. 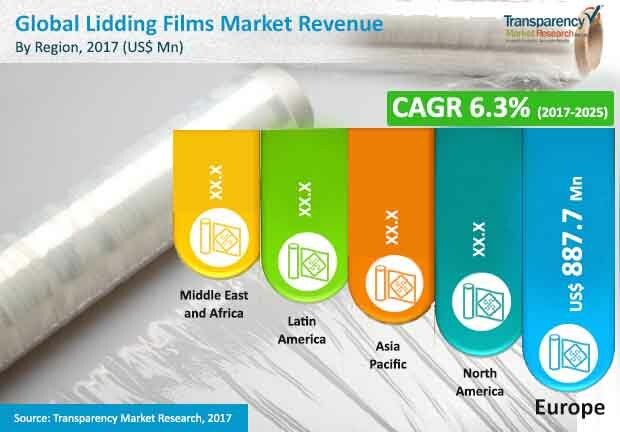 According to the report, the global lidding films market was evaluated at US$2.9 bn in 2016 and is estimated to become worth over US$5 bn by the end of 2025, registering a CAGR of 6.3% during the forecast period between 2017 and 2025. Globally, on the basis of material type, the polypropylene segment is estimated to lead the market in 2017, holding 20.2% share vis-à-vis value. Among the key product types, the high barrier lidding films segment is estimate to hold the leading 53.6% market share in 2017. Geography-wise, Asia Pacific is anticipated to be a lucrative market displaying the leading CAGR of 7.2% over the forecast period. The changing lifestyle of consumers, across the world, is a key factor for solid growth of the lidding films market over the past decade. Due to the fast-paced lifestyle consumers are increasingly switching to organized retail channels such as supermarkets and hypermarkets for everyday needs, which has positively impacted the lidding films market. In particular, in emerging economies, the growth of the organized retail sector which has emerged as a significant channel for sale of consumer goods is expected to boost growth of the lidding films market. The high barrier property of lidding films that helps retain freshness of food for longer time is suitable for changing domestic structure in urban areas. This in turn, is aiding the market’s growth. In addition, rise in budget of brand owners for branding and promotional campaigns for newly launched products and pipeline products has paved way for the growth of lidding films market. Several food and beverage brands prefer lidding films for promotion as they enable high brand visibility. Brand owners preferences regarding lidding films is also dependent on the type of material used. Despite a number of driving factors, the growth of the lidding films market is challenged due to several factors. This includes adverse effects of lidding films on environment, government regulations, and consumer perceptions.